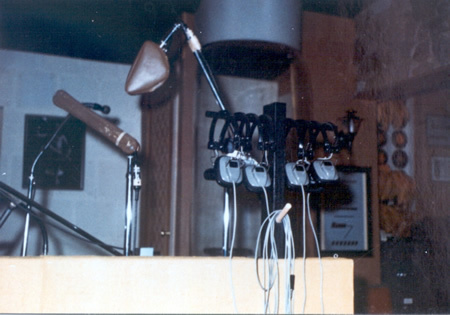 The legendary vocal booth at Glenn Studios. The Exiles, a group of Valley youths, have recently completed a second engagement at the La Paz Hotel in Palm Springs, a teen-age night club. The band is composed of Grey [sic] Hampton, Danny Stephens, Jim Ferguson, Merrell Fankhauser and Jeff Cotton. Under the leadership of Fankhauser, who is also the lead guitarist and vocalist in addition to writing a large number of their songs, the group has been attracting considerable attention in the Valley and other areas. All are students at Antelope Valley High School or AV College. The Exiles recording of "Please Be Mine" on the Glenn Label reached a rating of nine on the music charts within the first few weeks after its release. 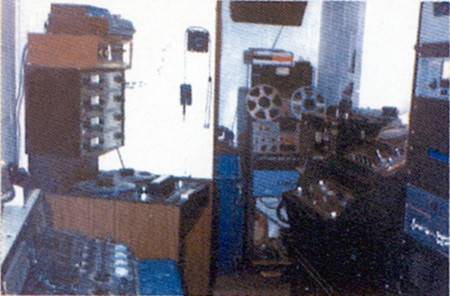 Additional attention was received when Cash-Box-Magazine gave a B plus rating to the flip side of the same record: "Too Many Heatbreaks". Both songs were composed by Fankhauser. 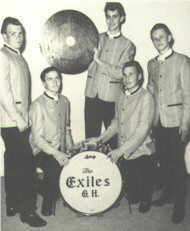 The Exiles have played to near capacity crowds at Jane Reynolds Park since their formation and have several dances booked for the summer months on the coast and the San Joaquin Valley. Photographs of the band from 1964 (which seem to be from a publicity shoot for the Please Be Mine single as there are a number of variations on the same theme) show them dressed identically in their stage uniform of dark trousers and black-trimmed striped collar-less buttoned jackets. The very young, short-haired Jeff (far right in photo on the right) looking as if the over-large jacket is about to consume him. 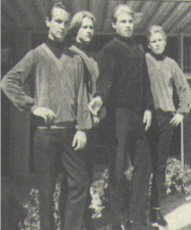 By 1965 these outfits had gone in favour of a more casual polo-necked sweater uniform and Jeff (second from left in photo below) looks more assured. His hair now well past his ears is an indication that he's already moving on from the other guys in the band. His guitar playing was developing in leaps and bounds. "Merrell approached me and asked me to join his band. John Day (played piano)and I had a band called the Chevelles that we thought was the best band in Lancaster at that time, but Merrell had a recording contract. So John and I joined the Exiles. At the time we joined Dan Stevens was no longer a member of the Exiles. Both John and I played on "Send Me Your Love" and "Dont Call On Me" we also played on a couple of other songs that were never released. During this time is when Jeff started letting his hair grow, he was the first person I ever saw or knew that parted his hair right down the middle." Despite being in a relatively successful band, recording and touring Jeff still attended Antelope Valley High School. Although long hair was not normally allowed at the school Jeff was able to keep his because, apparently, it related to his employment in a professional band! This was presumably quite a concession by the school as another student was refused attendance at his own graduation if he didn't have his hair (which was shorter than Jeff's) cut. Find out who WAS in The Exiles? "We had this booking agent that Jeff and I didn't see eye-to-eye about," Fankhauser explained. "We had a buzz going in L.A. with 'Can't We Get Along' and we were getting a lot of gigs at the hot clubs along the Sunset Strip and then this agent books us for six weeks at Christmas time at this logger's night club in the snow up in Portland, Oregon. "We walked into this night club, the Town Talk Lounge, and the first thing these loggers said was, 'Oh, man, when did school let out?' They grew to like us but we were going to be there for six weeks, while the agent returned to sunny L.A. to collect our checks and take his 50 percent. I thought that wasn't right and didn't want to be stuck up there for Christmas so after a couple weeks I quit and took a bus back to LA. "The rest of the band tried to finish the gig as a trio but it didn't really work out. Driving home with the manager, they all got arrested because the car the manager had was reported stolen. Jeff woke up in the back seat of the car with a police shotgun in his face, and they all got thrown in jail until their parents showed up to bail them out." That was the end of Jeff and Merrell working together as The Exiles on any regular basis. Who was in The Exiles?